Crocodiles have the strongest bite out of any animal in the world! Crocodiles are large aquatic reptiles that live throughout the tropics in Africa, Asia, the Americas and Australia. To the untrained eye, crocodiles and alligators appear to be similar but they belong to different biological families. The most obvious differences between them are visible in the head with crocodiles having narrower and longer heads with a more V-shaped snout in comparison to alligators that have a U-shaped snout. 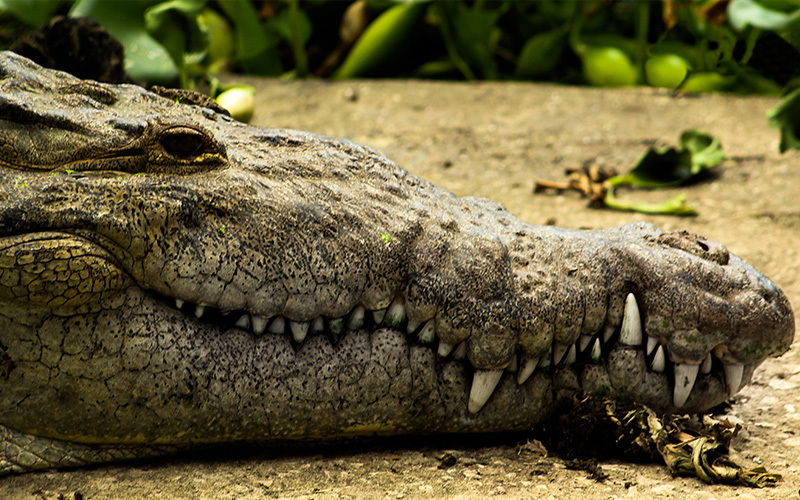 The lower teeth of a crocodile fall along the edge or outside the upper jaw when the mouth is closed therefore all teeth are visible unlike an alligator. Considered a rare species the American Crocodile can be found throughout the Caribbean and South Florida and tends to prefer brackish water but will also inhabit lower stretches of rivers and true marine environments. Their diet consists mostly of aquatic and terrestrial vertebrates.